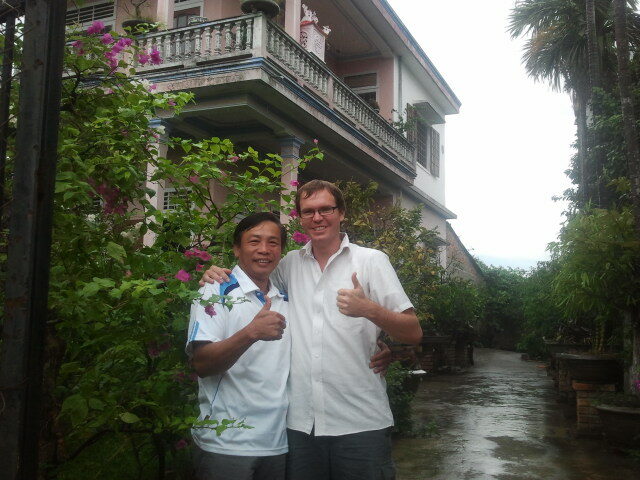 Our journey begins with a promising young Vietnamese college student named Thui. We met Thui a few weeks ago at a coffee shop where she works during the summer. She brought us noodles, we told her she was nice, one thing led to another... next thing you know, she's taking us to her hometown to meet the parents. Over the weekend of Vietnamese Independence day, we traveled with Thui by train to a little Vietnamese country town called "Quang Tri". 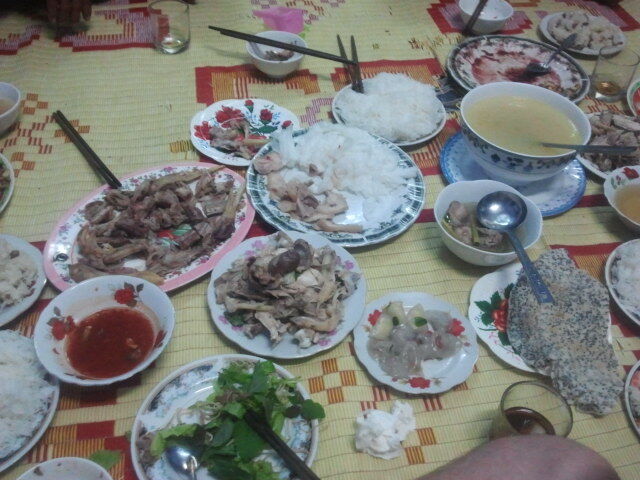 And there, we were magically transported into your average Vietnamese family for a weekend. It was amazing, and intriguing, and... frustrating in some ways, but an experience I wouldn't trade for anything. The train ride was about 3.5 hours. 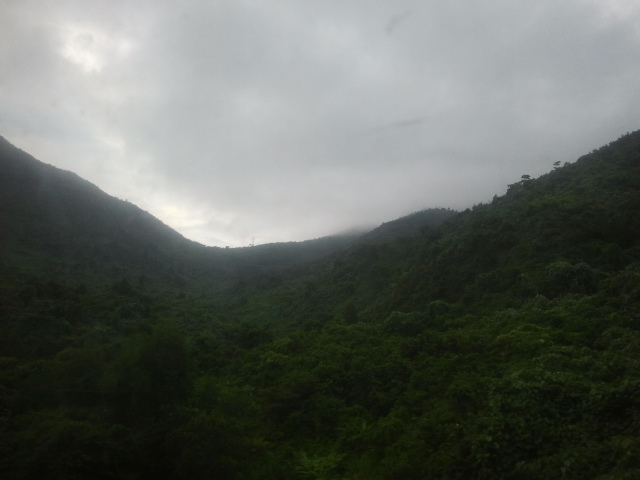 There was some AMAZING scenery travelling along the coast, but overall there was nothing special to report about the train ride. Except that Thui bought the snacks and, judging by what she knew about American diet, she provided us with "sausages" (hotdogs wrapped in plastic and eaten cold like a candy bar). "Blarfy" is the word I am choosing to describe it. Yes - Blarfy. Upon arriving at Quang Tri, we were literally "embraced" by Thui's parents. They were soooooooo happy to have us there! I get the feeling that foreigners are a rare and exotic commodity in the country side, and they were pumped to have us in their home. The following days they reinforced this theory by showing us off to the whole neighborhood and all of their family (which was a veritable army of people since practically everyone in the town is related). Risa says it wasn't that many people, and it was a holiday so maybe they get together for holidays anyway. Both Thui's Mom and Dad come from large families (7 or 9 kids each), and we met maybe 3 of them total so it wasn't an army, but it was fun. Let me say that it is somewhat difficult to tell Vietnamese beds apart from American kitchen tables due to the complete lack of mattress, sheets, or anything fluffy or comfortable. Our bed did have a mat of bamboo tiles to cover it... but I think that might have just made it MORE unyielding. I've slept a lot on the ground, being the assistant scout master before we moved here, and I can reliably say that the ground is NOTHING compared to the brutality of Vietnamese beds upon one's back, hips, and shoulders. It was okay though - it was all part of the experience. And I'm sure if you grew up sleeping without a mattress, it's probably the most comfortable thing in the world. I must emphasize at this point the MOST IMPORTANT part of the trip. That is that Thui's family and all their friends and relatives are AMAZING people. They were so loving and welcoming and warm to us, I had a hard time accepting all that gooey love! Everyone we met was truly amazing. Okay - now for some crazy food adventures! Apparently the only thing they do in the country in their leisure time during holidays is eat. Because that's pretty much all we did. One of the meals we had involved a dish called "duck blood". 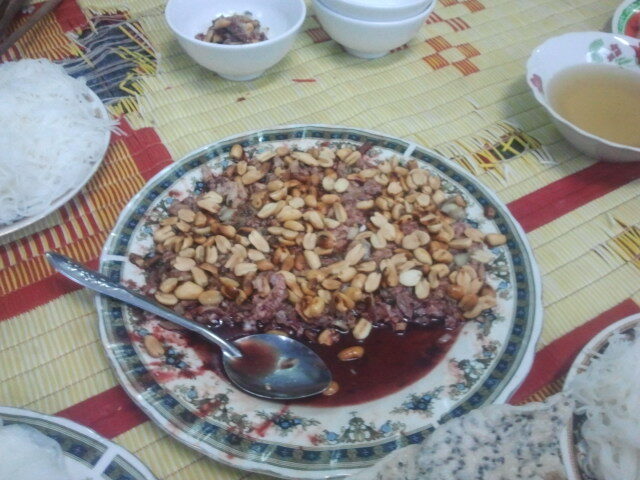 It entailed some meat-like chunklets swimming in deep red liquid (duck blood I assume), covered in peanuts. It was actually pretty good, but a little creepy, even for my taste. It was also the fanciest of the meals offered us, so we felt obligated to eat it. A lot. I think I ate so much that I wasn't hungry for a full 20 hours after. After dinner, they managed to find a guitar somewhere (a neighbor I think) and I played while Thui's dad and his friend sang. And man - those guys LOVE to sing. I bet they kept it up for 2 hours at least. They would give me a rough idea of the tempo / beat they wanted me to play, and then they would just belt it out. Sometimes for 15 minutes at a time! It was the craziest jam session I've ever been a part of. I loved it. As far as sight-seeing, they took us to a war museum in their town, along with an amazing bell-tower and a huge ancient Catholic church. The best part of the church was a huge row of angel statues with water coming out of their fingers you could turn on and off. Not sure what that was for - washing, or drinking I assume? No idea. Getting home was both sad and a major relief. 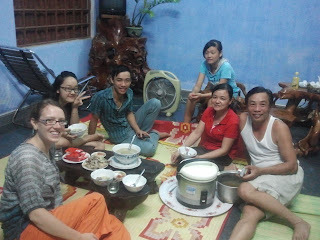 Mattresses and showers were embraced with joyous reunion (oh yeah - there was no shower at the house in Quang Tri either. We washed ourselves out of a giant water tub in the bathroom. It was pretty cool!). But, it seemed a little lonely to return home after having spent 2 solid days with so many wonderful people. Overall the trip was really neat and I'm glad we did it. Check out the pics! These two photos are of Thui's Dad's friend, a really great gardener who invited us to his house. He had a beautiful house and offered us Tea (which we politely declined), and instead he offered us a sweet bean drink and fresh mangoes. 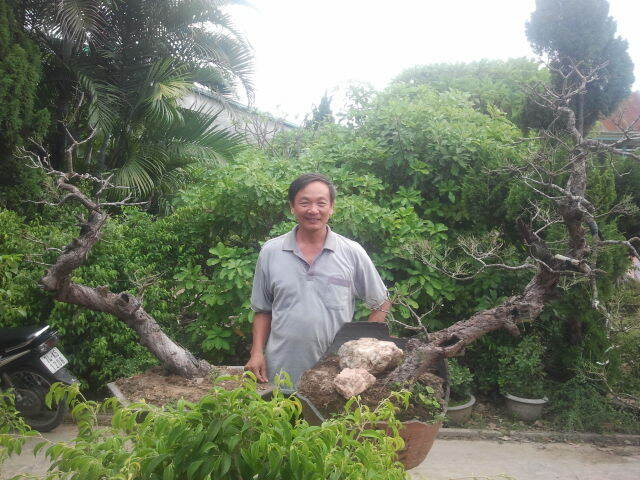 He was very kind and had some very beautiful bonsai trees that he was caring for. 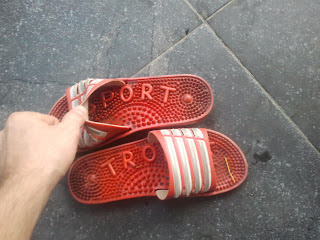 Here were some shoes of Thui's family, we thought it was kind of funny how the right one read "Sport", and the left one read "Trops". 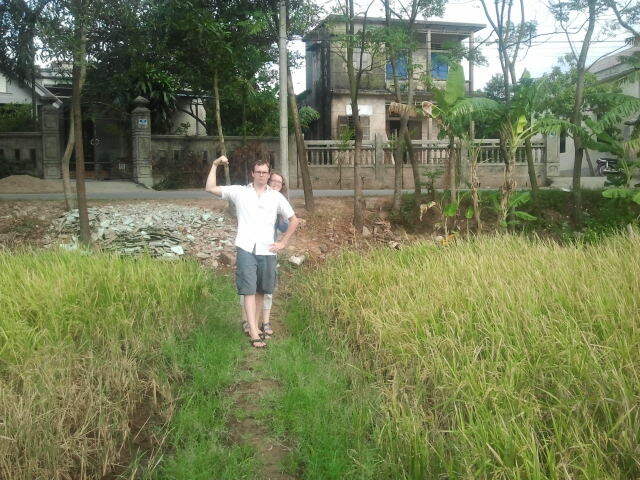 Us in a rice paddy around the corner from Thui's house. Here's a shot from riding on the motorbike, Thui drove me and her dad drove Michael. Here we are at the memorial museum, there were a lot of people here to commemorate Vietnamese Independence Day that day. Here's the giant bell tower they took us to. Here's Risa and Thui's dad at the riverside. Here's a view of the Catholic cathedral/monument thing. It was definitely apparent that East meets West out here. It was established as Mother Mary was supposed to have visited some Catholics at this location back in the 1800's I believe. Here's the building at the Catholic Church, this building isn't used inside anymore I don't think but it had a large picture of Mother Mary on it and signs telling the story of the church here. Here are the angel statues. Here's the beautiful sunrise that greeted us the morning we woke at 5:15AM to catch the train. Us at the train station enjoying an early morning snack before we leave. They were so kind and insisted on giving us a lot to eat, while they all said it was too early for breakfast so none of them ate. They were so kind to us, they wouldn't even let us pay for any of the food. It was such a neat experience to be on the receiving end of such humble generosity. How awesome! When you come home will make me duck-blood? I promise not to call it blarfy! Hello from Utah! It's laurel from tales of a busy housewife. You made my night with your comments. I really miss Singapore and I am so glad we did it. Even as hard as it is sometimes. 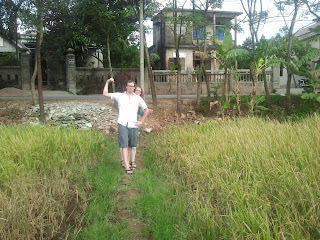 How is Vietnam? Email me at qwnnbee@gmail.com. I would love to stay in touch! I have so many questions and comments. I'm going to go through your blog. Thanks for stopping by my blog. What an amazing experience you are having! What wonderful people. You two look so happy! Miss you Risa.